Pictures of installations - Manuals & Examples - SolarVenti Ltd.
OBS: Some of the pictures are of the old thicker SolarVenti model. The new model is much slimmer. 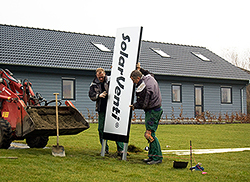 Today the new models are much slimmer, for instance the modern SV30 Solar Air Collector is less than three inches thick. The effect however is unchanged high, and the advantages of solar heating and dehumidification just as good as shown.